Lean back and discover our Family Spa - the bathing and wellness area for the whole family in the Allgäuer Berghof. Let your mind wander and enjoy the time together with your children or know that your loved ones are always perfectly looked after, thanks to our wellness hotel with child care. In our separated non-swimmer area even the youngest one can paddle and splash safely. Here the kids splash around with mum and dad in the shallow, 35°C warm goldfish pool. The spraying Froschi- and Happy tub of our family-friendly children’s hotel with wellness offer invite to relax in the pleasanty warm water with mum and dad. Thanks to the small water slide and the funny duck race track big fun and variety are always guanranteed in our kids’ padding pool. Those who need a break from playing and paddling between times can relax on one of the cosy loungers with mum and dad and dream of the next duck race. The indoor pool of our wellness- and children’s hotel is designed so spaciously, that even fanatic swimmers can swim their laps and wild pool pirates come into their own as well. In the pleasant hot water pool big and small water rats can unconcernedly drift away and also for our baby swimming, the 33° C warm water is optimal. The numerous massage showers and jaccuzi benches of our family hotel with swimming pool provide special relaxation for tired muscles after a demanding skiing- or hiking day. And if you are all have enough of all the splashing and sliding, the entire family can rest and cuddle together on one of the more than 50 cosy family bunks. This offers you the perfect opportunity to relax together with your children during your totally stressfree wellness holiday in our family-friendly hotel in the Allgäu. The highlight for all kids – and of course also for all parents who love to slide – is our giant tunnel slide - the aqua racer. Up you you go in the classic way by taking the stairs, or –for even more fun before sliding – through the climbing tunnel. In the aqua racer of our children’s hotel with swimming pool, one races down the 83 m long tubular slide in its tire in swinging motion. For those who like to slide right next to or against each other, the wide wave slide is the right thing. Who has the best sliding-techniques and is down first? From our funny floating „nests“ you have the perfect view of all water slide fun and you can fanatically encourage your siblings and your new bathing friends. 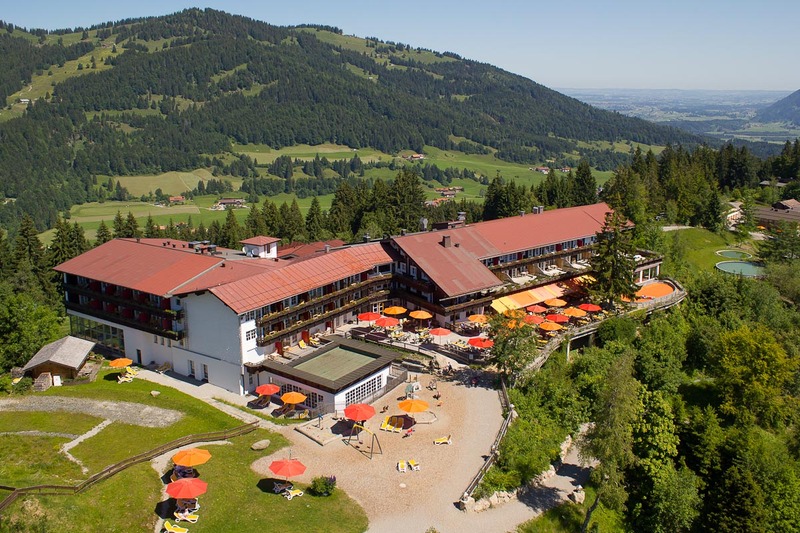 Enjoy wellness with kids in Bavaria in a completely new way. Unbend body and mind, while swimming a few laps in the year-round pleasantly heated outdoor infinity pool. The magnificent view of the Allgäuer Alps, which you can enjoy from our panoramic outdoor pool, will amaze both young and old alike. In summer, it’s also very pleasant to relax on our spacious sunbathing lawn during your wellness holiday in the Allgäu. While mum and dad are enjoying sunbathing on one of the comfortable deck chairs with a unique view, the little ones are horsing about and having big fun on the lush, green meadow. In our wellness- and children’s hotel you will enjoy your holiday in Bavaria with the entire family to the full. Relax together with your children in the family sauna complex and escape from the everyday life. In our funny sauna the little ones will definitely not get bored thanks to the funny games and surprises. Discover our brine steam bath as well, it has a beneficent effect on skin and bronchial tubes for you and your sweethearts. For refreshment you can use the fountain, where young and old can quench their thirst at all times. In the quacking showers of our family spa, taking a shower is great fun. And even mum can take a shower in peace after her sauna session – the integrated playpen makes it possible. The most beautiful children’s hotel with wellness offers in Germany offers something for everyone: whether the benificent steam bath or the family sauna with child-friendly temperatures – with us you guaranteed find pure relaxtion for young and old thanks to our wellness with child facilities.